I feel like I am becoming a religious convert. My new religion is dogs. I am a believer! 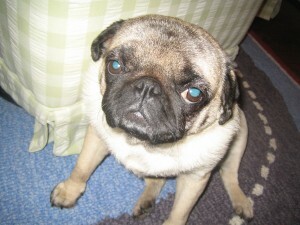 We have a pug named Bella that is 11-years-old. We got her when she was a puppy just a few months after Barry and I got married. Before the kids came along, she was everything to us. She was immediately treated as our equal and had all the advantages of the human world like people food treats, hanging out on the couch and sleeping in bed with us. We actually bought a house for her because we wanted her to have a nice backyard. Over the years, with the addition of 3 kids, we have become very lazy with the training that we initially gave her and her care in general. She spends about 80% of her day on the couch asleep. We rarely take her for a walk. We rarely “play” with her. Although we all love her very much, she has become an accessory in our home and a nuisance when it comes to stealing food, barking out the front window, and snapping at me or the kids. Lately, she has become somewhat aggressive whenever food drops on the floor and someone tries to pick it up. Two weeks ago, she bit me when I tried to block her from running out the front door. Barry and I thought it was just old age. We thought that she has just become a lazy grumpy old lady. Nothing to be done, just leave her alone. In general, I thought dogs were people; specifically, poorly behaved children. Sure, you could make a dog be obedient, but you have to start very young and be very diligent. Who has time for that? I also thought it was just part of dog ownership to deal with all of the hassles that they can create. One thing that I think is really smart about this program is the preparation process that goes along with the training. Before coming to Portland, I had required reading. 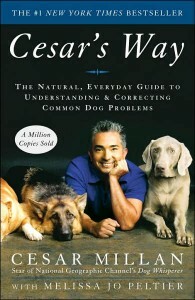 One of the books was Cesar Milan’s book Cesar’s Way. This was a great read because it started to change my mind about the basic nature of dogs. I started to learn more about pack behavior and dominance. I started to learn more about rules and making dogs happy with their lives by setting boundaries. I started looking at Bella differently: It’s not age that has made her difficult and grouchy. Our pampering and lack of discipline has made her difficult and grouchy. Now that I have been here training for a few days, I can see that these things are true. There have been moments when I have started to feel sorry for Hope. I never would have believed that a dog could resist people food and I could never really understand why it would be so bad to sneak her a little bit. Now, I know that by blurring those lines between master and owner, we confuse our dogs and make them feel insecure. She is a happy dog. She doesn’t bark or get excited or snap or growl. That is not because she has been punished or mistreated. It is just he opposite. She doesn’t do those things because she is fulfilled by her place in the world and she knows it well. She is happy and secure under the leadership that has been shown to her. I only pray that I can continue on with that very precious guidance! Meanwhile, back home, Bella is in for some changes when I return. She used to be a pretty well-behaved dog. I know she has got that in her still. It is up to me and Barry and the kids to help her find her happiness with a new structure that she can rely on. She will find comfort in her new position as the obedient follower. I am still working out what, exactly, that will look like, but I feel confident that we are all going to be better dog people through this experience. I’ve ordered the book at the library after your recommendation. I’ve heard of this legendary dog trainer before, so it’s a good idea.